When the film‐maker Morgan Spurlock told an American festival audience ‘we live in a world where independent documentary film has truly become the last bastion of free speech’ he won a round of applause from the packed house. Michael Chanan’s wide‐ ranging and illuminating study of international documentary film‐making re‐ reads its complex history and present flourishing from the perspective of this fundamentally democratic aim. This book traces the history of the documentary from the first Lumière films to Grierson and his contemporaries, through to Free Cinema, Cinema Vérité and Direct Cinema, up to the current resurgence documentary with high profile films such as those of Michael Moore. The book’s thematic approach takes in topics such as the documentary before documentary how documentary film language works, the veracity of the image, the construction of the soundtrack; the migration of documentary to television, political documentary, censorship, first‐ person film‐making, and the relation of the archives to history and memory. Drawing on examples of documentary cinema in Japan, Iran and Latin America as well as Europe and the USA, Chanan argues that documentary provides a crucial public space in which ideas are debated, opinion is formed and those in authority are held to account. 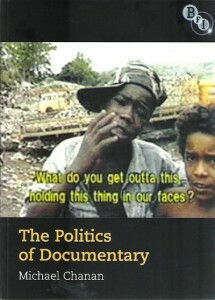 Trying to define the documentary film is by any measurement an uphill task. Is documentary a genre? Does it have a greater claim to ‘truth’ (whatever that might mean) than a fictional feature or short? Quite simply, what is it? Just trying to answer such basic questions about the form immediately opens up cans of worms by the shelf‐load. Therefore in his attempt to construct an understanding of documentary Michael Chanan certainly has his work cut out. It is a pleasure then to report that his latest book, disguised by a rather dry title, is an extensive Historical, conceptual and yes, political review of the documentary film that is immensely readable whilst always remaining challenging and erudite. Chanan provides us with a selective history of the form that, whilst including such usual suspects as Vertov, Jennings and the Free Cinema movement, introduces us to overlooked filmmakers such as Japan’s Kamei Fumio and Akira Iwasaki. His chapter dealing with documentary in 1930s Japan is an alarming reminder of how narrow our knowledge and experience of such filmmaking is in the West. The politics of the book’s title are tackled in a subtle manner with refreshingly little space given to the more obvious filmmakers with an overtly political stance (Leni Riefenstahl and Michael Moore barely get a mention). Instead Chanan chooses to explore the underlying influences of politics on documentary filmmaking. It is these forces which are shown to be crucial to the production, reception and consumption of documentary films and he vividly demonstrates how that they are capable of being transformed and translated in different ways through techniques such as montage and voice over, and more pervasively, by an ever changing historical perspective. Chanan also attempts to answer some of the basic questions about the form (such as those raised above). One of his most persuasive lines is his attempt to construct a description of what documentary film is. Borrowing from Wittgenstein he posits documentary as being a ‘family’ of film forms inked by a common gene pool that like family resemblances can be identical, similar or totally different. This approach, in itself, proves an elegant way to bring together the menagerie of films gathered under the umbrella term documentary; from Emile de Antonio to Patrick Keiller, Jean Rouch to Nick Broomfield, and Agnes Varda to Errol Morris, to name only a few. This book will be invaluable to exponents and students of documentary filmmaking, giving a fresh perspective on its history and techniques. For those who may want better to understand the history and codes of the form, it provides a thought‐provoking perspective that takes in not just those who have made the films but also the ideas of such figures as Walter Benjamin and Jacques Derrida, making this volume a thoroughly enjoyable workout for the intellect. This entry was posted in Books and tagged documentary. Bookmark the permalink.